« Peppa Pig World – our AMAZING day! – It all seems to go very smoothly….for about 10 seconds! – Who do you think Little Madam thinks is the soft touch!? Just to say that it was another 10 minutes before I think they started to settle but they must have got quiet because I crashed and burned first! Bad parent that I am! We thought this was so funny but so far no one else has thought so therefore I have put it in the delightful Theboyandme’s brilliant show off show case! 15 comments to It’s sleep time now! many a sleepless night we have spent in a hotel room with all the kids…..and it doesn’t even seem to get better when they get older! We’ve tired family rooms before. Never again!! Wherever possible we get rooms with adjoining doors. Sharing beds with youngsters sounds like great fun – but you pay for it the next day!! Oh what hotels do you use that have adjoining doors? I probably couldn’t do that with mine still so little could I? Hmmm often sounds like this in my house when my little man is in his own room! The other morning at 5.30am I heard “Mummy, I need to go back to sleep!” Well yes he did!! I had to go and tuck him back in and find his dummy first though!! I wish mine would call out to go back to sleep. They holler from the rooftops they are awake until the whole house is and the street! I listened to this the other day with The Boy and we thought it was very funny. Well I did, he kept saying “babies, go sleep!”. What time did you all go to bed then? I hate sharing a room with The Boy now, none of us sleep well at all. 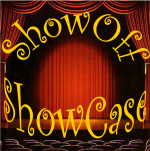 Thanks for linking up to ShowOff ShowCase.